I’ve conducted hundreds of prairie fires without incident, but still feel a sense of relief every time we wrap another one up successfully. Today’s featured photo shows the tail end – the denouement, if you will – of one of this year’s spring fires. To me, it perfectly captures the emotion of finishing a successful burn. The crew has just finished lighting the last segments of the fireline and finally, after a couple hours of hard work to keep the fire within our mowed firebreaks, we can all relax for a few minutes and just watch the fire burn itself out. It’s hard for me to judge the aesthetic or artistic quality of images like this one because the way I feel about this image is so tied to how I felt when I took it. When I look at this photo, I can actually feel my stomach unknotting as I made the mental switch from the stress of keeping the fire corralled to the much easier tasks of mop-up and debriefing with the crew. 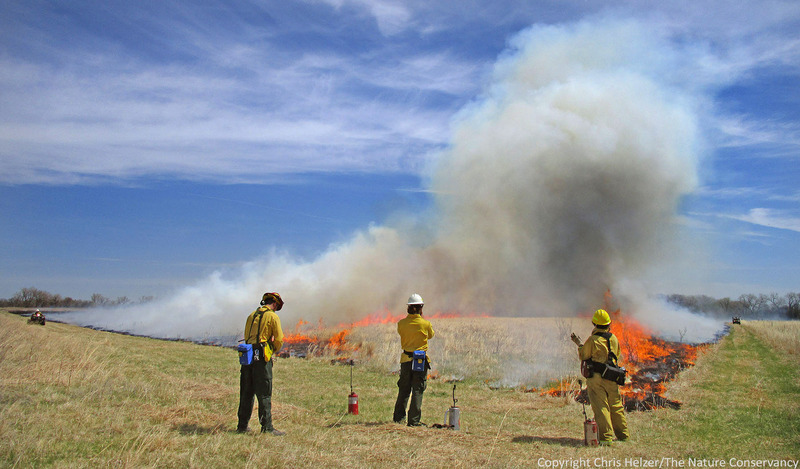 This entry was posted in Prairie Management, Prairie Photography and tagged burn, controlled burn, end of burn, end of fire, fire, grassland, grassland fire, ignition, prairie, prescribed fire by Chris Helzer. Bookmark the permalink. Great phot! I always associate controlled burn photoes with the amazing smell that stayed in my ‘burn clothes’ for months….sigh…. So I was wondering how an area is defined, so it is by mowing? Do they also wet the edges or something? Do you wait until it is completely out to leave the area? Good questions, Suzanne. Yes, we mow a boundary around what we want to burn (a fire break), and rake out all the grass we can. That makes it hard for the fire to cross those areas, and then with the use of water, we can pretty easily control the fire and keep it inside the mowed lines. Sometime we wet the edge before we light, but other times we light first and then just spray water on any fire that tries to creep into the mowed break – it depends upon the day and weather conditions. We usually burn the downwind end of the fire and create a wide black area, then light the upwind end of the unit and let the fire run until it hits the black and puts itself out. Then, yes, we wait until it’s completely out. Usually, with a grass fire, it burns out pretty quickly. Sometimes, there are sticks or dried manure piles that smolder for a while, so we move those further into the unit (away from the edge) when the fire is over and let them burn themselves out. thanks. I came across a place this spring that had several areas still with burning logs etc inside of burned (small) areas but no one was there watching it. I thought it was a bit dangerous but wasn’t really sure. Chris, how do you decide what part of the prairie to burn.? Is there a sequence to sections or do you go by the way it looks? Or, are there other reasons? Mike – good question with lots of answers. Easy answer: it depends upon our objectives. More complicated answer: in this particular case, we’re using the fire to focus grazing in one part of the prairie and thus to lure grazing away from other parts. We burned the part of the prairie that had accumulated the most thatch (fuel) because it will burn best and because it had rested/recovered enough to withstand a season of fairly intensive grazing. Next year, we’ll repeat the selection process and pick the next patch based on thatch/fuel again. Hi Chris. I notice the mowed break has a lot of green in it. Is that brome? If so, I was wondering whether you notice the mowed strips being a little more weedy (or having more brome) than the areas you burn. I suppose it would be like haying, but still wondered whether this was an issue, especially along prairie edges. Hi Patrick. Great question, as usual. Much of the green was Kentucky bluegrass, but also brome and a few natives. If we mow the same areas year after year, it can favor those cool-season grasses, though grazing offsets that somewhat. We try not to put the breaks in the same place repeatedly to avoid some of that affect. I’ve definitely seen that in ungrazed areas, where people mow breaks in the late summer or early fall, and put them in the same place each time – it can really encourage cool-season grasses there, at the expense of other species. Typically when burning a prairie the wind is out of roughly the same direction. I have always wondered if burning an area the same way results in observable vegetation patterns? It is hard to tell in my region because the topography and varying soils mask any pattern that might be created by consistently burning an area the same way. James – I don’t think I’ve seen any significant differences in vegetation response based on wind direction. I’ve heard people talk about seeing differences between backing fire and head fire impacts, but I’ve tried mapping those out and looking at them later, and I’ve not seen anything. Perhaps with woody vegetation, the longer residence time of a backing fire can have a different impact, but with herbaceous vegetation, I usually don’t see any differences (unless either the backing fire or head fire results in a more or less complete consumption of fuels – which can happen). Overall, though, I don’t see the kind of differences you ask about. The question is based on observations from my area where most prairies are surrounded by trees and gray dogwood can over take the grasses with just a few years absence of fire. It seems to me gray dogwood is always thickest on the up wind side of a unit since the fire does not have enough time to build up strength. We have three separate areas in our three acres we burn routinely. And even though they are way smaller that what you accomplish, we still have those feeling. Especially with homes less than an acre away on both sides.